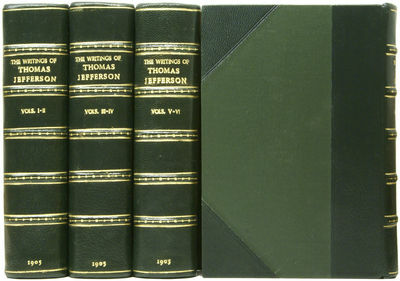 viaLibri ~ The Writings of Thomas Jefferson. The Definitive Edition. Containing his Autobiography, Notes on Virginia, Parliamentary Manual, Official Papers, Messages and Addresses, and Other Writings, Official and Private, now Collected and Published in their Entirety for the First Time... With numerous Illustrations and a Comprehensive Analytical Index. The Writings of Thomas Jefferson. The Definitive Edition. Containing his Autobiography, Notes on Virginia, Parliamentary Manual, Official Papers, Messages and Addresses, and Other Writings, Official and Private, now Collected and Published in their Entirety for the First Time... With numerous Illustrations and a Comprehensive Analytical Index. Washington, DC: The Thomas Jefferson Memorial Association, 1905.. FINELY BOUND COMPLETE WORKS. 20 volumes bound as 10. Octavo (23 x 16cm). Frontispiece to each volume, and a plethora of letters, photographs and engravings. Half green morocco with raised bands, gilt titles and decoration to spines, matching green cloth boards; top edges gilt, others untrimmed. Internally clean, exterior fine. A very attractive and distinguished set and a robust recent leather binding.